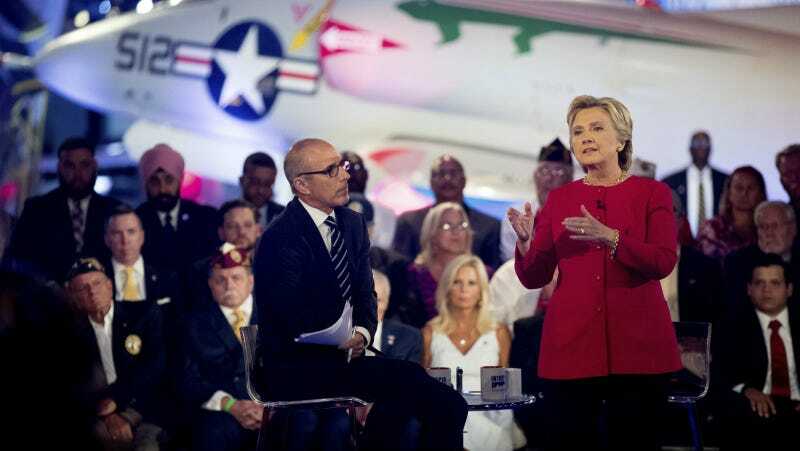 There’s a belief gaining traction Thursday morning that Matt Lauer did bad and should feel bad about his performance as moderator for NBC’s “Commander in Chief Forum.” Lauer allowed Trump to lie, bloviate, and spread fact-free word diarrhea all over the stage, while urging Hillary Clinton to reply “briefly” when a veteran asked how she planned to defeat ISIS. Lauer is, as the New York Times put it, facing “storms of criticism” for letting Trump lie about things like his support for the Iraq war, which he often claims he never supported. He did support it, in fact, as he said to Howard Stern, a fact that NBC itself pointed out in a fact-checking story last night. Later, when an audience member asked about Clinton’s plans to defeat ISIS, Lauer urged her to reply “as briefly as you can,” setting off an instantaneous wave of disgust on Twitter. Maybe a “court system,” he added. Maybe that would work? Trump appears to mean that literally: that there is no court system in the military and we have to create one. While only about one in 20 military court martials for sexual assault lead to jail time, there are, you know, military court martials for sexual assault. That is a system that exists. It is there. Clinton is set to hold a press conference this morning, where she will probably remind the public that she is not a deranged, erratic reality TV star.